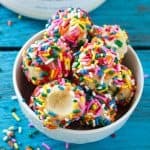 No-bake protein bites that taste like birthday cake and high in protein! Place the protein powder, sweetener, coconut flour, coconut oil and water in a bowl; stir until a dough forms. You may need to add more water, 1 teaspoon at a time until desired consistency is reached. Form tablespoon-sized balls of the dough. Place the sprinkles on a plate and roll the balls in sprinkles.